Matt Williams: "Walk on the 'Positive' Side"
Matt Williams was deep in thought as he leaned into the microphone. It's 5 p.m. on ESPN Radio 860 in Phoenix and the topic of the day was the 2004 Summer Olympics in Greece: Are U.S. women athletes finally getting the media exposure they deserve? "How about what they're wearing for volleyball?" asked host Roy Garibaldi, as he introduced the segment. "I've never enjoyed volleyball like I enjoyed it last night, I got news for you!" "Fundamentally, that's wrong, Roy," scolded Williams, his co-host. "You are supposed to enjoy the sport, not what they wear." Garibaldi was unapologetic. "I enjoyed both, thank you very much. I am human." "I'm a true sports fan," Williams shot back. "You're so full of crap," Garibaldi responded. 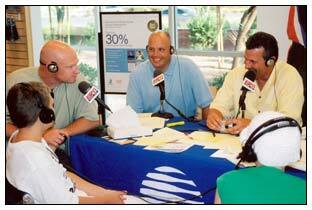 Welcome to "The Positive Side of Sports," a two-hour weekday talk show on ESPN affiliate KMVP in Phoenix.